Shovel Knight is one of the best games I’ve played so far this year. In fact, it’s one of my favorite games that has been released in recent memory. In my honest opinion, it’s the best game to come out so far in 2014. It does have some staunch competition coming in this 2nd half of the year, though. Shovel Knight is an 8-bit inspired platform medley of Mega Man, Ducktales, a little bit of Zelda 2 and Castlevania, with a sprinkle of Super Mario Bros. 3. On top of all of this, however, it manages to produce some exciting and unique features not seen in any of the aforementioned games. This game is pure fun, sounds fantastic, and has some really great tunes and some beautiful artwork. Shovel Knight was developed by Yacht Club Games; whom are based out of California. The game was funded by a very successful Kickstarter campaign. The minimum goal was 75k, and Shovel Knight went on to raise over 300k before the conclusion of the Kickstarter Campaign. Shovel Knight has two goals in this game: To defeat the evil Enchantress, and get some answers about his lost beloved companion, Shield Knight. However, throughout his quest, he is met by staunch resistance in the form of the Enchantress’s henchmen (and Shovel Knight’s mortal foes) The Order of No Quarter. These other quirky Knights attempt to block Shovel Knight’s passage to the Enchantress, and it is up to you to guide Shovel Knight to victory. Can you dig it? Cobra Triangle is a single-player action game, developed by Rare, and released in July of 1989 for the Nintendo Entertainment System. It was designed by the Stamper brothers, who would go on to provide us with all sorts of Rare goodness for the SNES and Nintendo 64. Following the critical success of R.C. Pro-Am, Rare chose many of the same aesthetics for Cobra Triangle, such as the isometric perspective the game is presented in. The main difference being that instead of Trucks racing, Cobra Triangle is a boat action game with some racing elements. David Wise composed the soundtrack for Cobra Triangle, who at the time, was an extremely prolific composer for many video games. Other games under his belt include; Marble Madness, California Games, Battletoads, and eventually even the beautiful OST for Donkey Kong Country. Cobra Triangle is a really enjoyable game, and in addition to racing levels, the game features several different kinds of missions such as; collecting mines from one area and depositing them in a detonation area whilst outwitting another boat trying to steal the mines back, protecting stranded people from enemy boats attempting to capture them, jumping waterfalls, and even battling enemy bosses. My least favorite stages are the waterfall levels. You must hit moving ramps at a certain speed to jump across the waterfall. If you miss, you automatically lose a life. As you can see, I died quite a few times here. There are 25 stages in the game, each section containing 5 levels of each different type of game mode, with the 5th level generally being a boss fight. The boss fights are pretty cool too, they feature a giant sea snake (as seen on the game cover), a giant crab, and several others. On October 18th, 1985 the NES launched in the United States in NYC. Although Super Mario Bros and it’s progeny would become some of the most beloved games in the NES library, Super Mario Bros didn’t actual release on launch day with the NES. 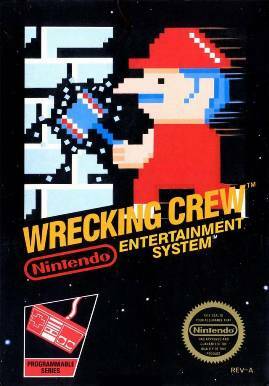 Thats not to say Mario wasn’t present in the launch of the system in the US, Mario was the protagonist of a lesser known game called Wrecking Crew. The game was designed by Yoshio Sakamoto, who would later go on to work on great games such as Metroid, Kid Icarus, Super Metroid and most recently he’s credited with supervising Nintendo’s much anticipated Splatoon. The player assumes the control of Mario in this arcade style game and instantly you will notice he looks a little funny. He’s wielding a giant hammer and his hat looks like a helmet. Apparently before Mario got into plumbing, he was smashing down buildings and avoiding eggplant men. He also doesn’t seem to be capable of jumping, which the manual explains is a result of the weight of the hammer. The objective here is to smash down walls using whatever means possible. Once the game begins, you’ll start with 5 lives, you can only lose these lives by coming in contact with an enemy, or by getting hit by a fireball. After you use up the five lives, you’ll get a game over. It’s also fairly easy to trap yourself on a floor with no way to exit, in this instance you must quit the game and start over. Wrecking Crew also has a level select option, so you can skip around levels. Level 100 is no joke. Join me as I count down my top 10 favorite Nintendo Entertainment System games! These are just my personal favorites, so let me know which games you think should be on a top 10 list. In this video we take a first look at Watch_Dogs on the PC from Ubisoft. I had some audio issues for the first few episodes but I worked them out, the sync is off a bit. All fixed in future Ep’s. Watch Dogs is actually a lot of fun, though it does have some shortcomings, it’s generally been better then /v/ and /r/gaming/ have made it out to be, no surprise there. Another quick LP of some Hearthstone; picks up where I left off last time! I’m getting better! Kind of. Not really. Hey! Just a content update real quick while I work on some other projects – there will be a few ep’s of this series. In this episode, I play a few rounds with my mage deck, I open a few booster packs, and just do terrible all around! A short look at what I’ve been playing recently; State of Decay, Hearthstone and Lichdom:Battlemage. All PC games; State of Decay and Lichdom are available on Steam, while Hearthstone is a Free to Play available through Blizzard’s, battle.net gateway. Happy Saturday everyone! I hope you have a minute today to check out my new video. If you enjoy, please don’t forget to sub, or leave me some feedback!